This blog has two halves. The beginning part is the science. If you only want the insider ‘goss’ on how our directors coped being veggies for a week, skip down to the end of my #5DaysOnTheVeg blog. 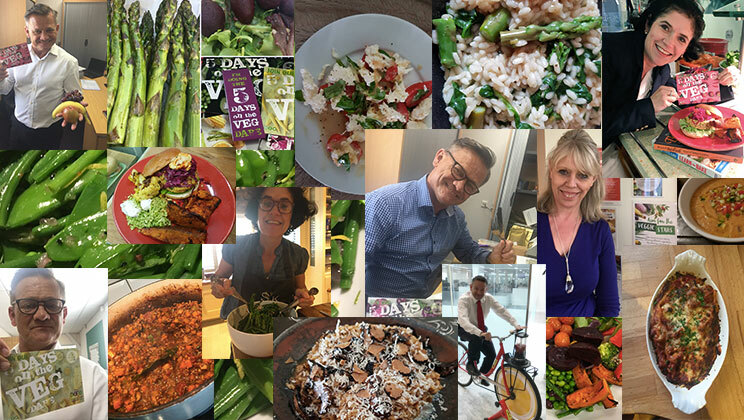 To celebrate National Vegetarian Week our directors trialled our new ‘#5DaysOnTheVeg’ dare. It’s designed to encourage healthy eating by raising awareness of the benefits of eating a diet rich in colourful fruit and veg and reduce the negative environmental impact of livestock production. There are nearly 2 million vegans and vegetarians in the UK now. The reducetarian movement, where people decide to eat less meat is also gathering pace. A 5/2 approach to eating less meat is also becoming popular. And we are seeing record increases in vegetarian meal sales in our restaurants. In a survey by Opinion Matters up to half of adults said they are adopting vegan buying habits and a fifth have reduced their meat intake. With this as a backdrop, Kate Cook, our nutritionist devised the #5DaysOnThe Veg campaign based on following a foodie rainbow. Rainbow eating is about eating foods which represent all six colour groups of the ‘phytonutrient spectrum’. A plant-based diet is centred on whole, unrefined, or minimally refined plants. It’s a diet based on fruits, vegetables, tubers, whole grains, and legumes which are all rich sources of phytonutrients. As an added extra, a plant-based diet is good for the friendly bacteria in our gut and vegetables make a comfy ‘nest’ for these guys to live in. So that’s the science low-down, how did we get on? Who were the #5DaysOnTheVeg stars? Our #5DaysOnTheVeg challenge was easy for some (me a life-long veggie) and let’s say a bit more challenging for others. Our MD Francois Gautreaux (a steak-eating Texan – need I say more?) threw himself into the #5DaysOnTheVeg challenge and posted photos on social media every day of his veggie triumphs. Highlights were asparagus risotto, quinoa burger with spicy sweet potato wedges and gazpacho. Steve Fox, our Purchasing Director planned the whole week in advance and blew his budget on day 1 with Ocado. But assisted by his partner Paul, he cooked some original and inspiring dishes including spinach cannelloni and stuffed peppers. Our Sales Director, Simon Houston cheated a little by cooking with quorn, a meat substitute, but we were proud of his efforts. He’s very competitive, so I can imagine that by the time he has finished reading my blog, he will have a show-stopping veggie dish posted on all his social media channels. As you would expect Pete Redman, our Chef Director turned each of his dishes into an Instagram story and blew us all out of the water with Rustic bean, rosemary and kale stew and Halloumi, pineapple picked slaw, red eye mayo, pickles and honey bread. Even Henrietta the hen who belongs to Ingrid Newbould our HR Director got in on the act. She laid her first egg many months on Day 1 of the challenge. David Hammond, our FD was our most reluctant veggie but even he managed. Though a lot of chocolate and very dodgy music was used to coax him through to the end. We are anticipating sales of meat to peak where he lives this weekend, to get his meat intake levels stabilised following a period of cold turkey (pun intended). We all agreed that our CEO, Ian Thomas went a bit kamikaze – cramming every plate with a rainbow and even blending his own smoothie on a bike. But we gave him full marks for his tireless effort and enthusiasm. Rumours that he is going to blend all our Raw and Ripe smoothies from now on are grossly exaggerated. It’s been a mad week of photo sharing on Yammer, Facebook, Twitter and Facebook. It was fun, with friendly rivalry and healthy competition of sharing our photos and commenting on each other’s triumphs (or not). It’s probably the most shared social content by the directors we have ever had. The comments ranged from gentle teasing to laugh out loud (mentioning no names David Hammond). There were debates between us about whether the aim was to show that eating more veggies was better for us or whether it was ‘delicious first and veggie second’? So it definitely achieved engagement and stimulated conversations. One of the many reasons I like working at bartlett mitchell is because we have lots of fun. Thank you to my co-directors for not taking yourselves seriously and getting on board with #5DaysOnTheVeg.